The forest in the Amazon Basin produces its own rain. During the wet season, aerosol particles, which serve to condensate clouds and precipitation here, mainly consist of organic material. These aerosols are released by the rainforest itself. This has been demonstrated by scientists from the Max Planck Institute for Chemistry in Mainz, who are now able to draw conclusions about the mechanisms of this ecosystem: the high content of organic material indicates that the Amazon Basin acts as a largely self-contained biogeochemical reactor during the rainy season. The results could also help scientists construct more accurate climate models in the future. They can therefore be used to analyse anthropogenic influence on cloud formation and precipitation. The air above the Amazon rainforest is cleaner than almost anywhere else on earth. This allows climate scientists to investigate cloud condensation under natural conditions. The results of this study may serve as a point of reference for future analyses of anthropogenic influence on cloud evolution and precipitation. Scientists from the Max Planck Institute for Chemistry have now made a valuable contribution to this. Together with international partners, they have, for the first time, used scanning electron microscopy and mass spectrometry during the rainy season to characterise the chemical composition of aerosols, tiny suspended particles in the air above the Amazon rainforest. Submicron particles have a diameter that is smaller than a thousandth of a millimetre and serve as cloud condensation nuclei. They consist of 85 % secondary organic aerosol components. These are formed from volatile organic compounds which are released by the forest ecosystem and which can be converted to low-volatile particles through photochemical reactions and condensate. The remaining tenth of the submicron particle primarily consists of salts, minerals and soot, transported from the Atlantic and Africa by the winds. More than 80 % of supermicron particles, which have a diameter of more than a micrometre, are made up of primary biological aerosol material, such as fungal spores, pollen and plant debris, and are directly released into the air from the rainforest. They serve as ice nuclei and are very important for the evolution of precipitation. The fact that aerosols above the Amazon rainforest are nearly completely of biogenic origin tells the scientists a lot about the ecosystem. "The Brazilian rainforest during the rainy season can be described as a bioreactor", says Ulrich Pöschl, who played a leading part in the study. Water vapour rises from the forest, compensating on aerosols. These are then transported up to a height of 18 kilometres. Water droplets and ice crystals grow in the clouds thus formed until they fall to the ground again as precipitation. Part of the precipitation evaporates and the rest irrigates the Amazon flora. The plants, while growing, continue to release organic material into the atmosphere, on which new clouds grow. 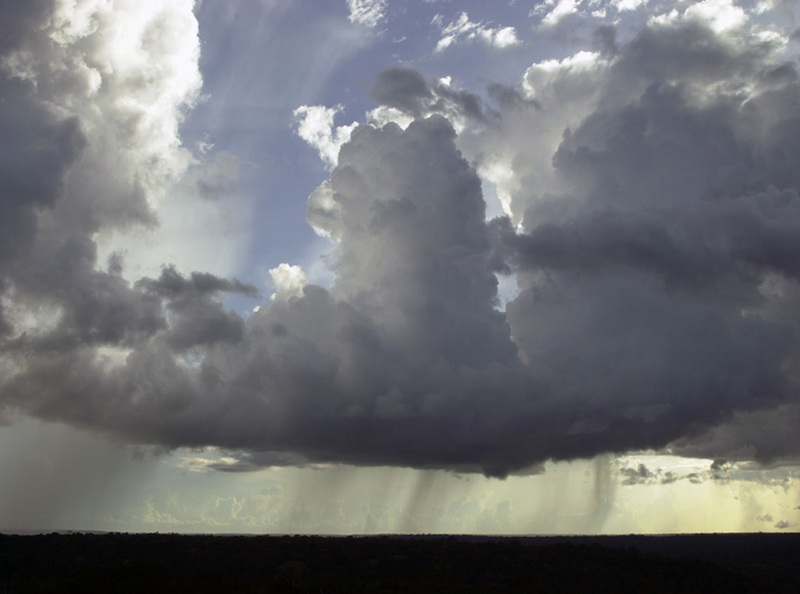 The findings about the natural process of cloud condensation provide scientists with information about what differentiates it from the cloud condensation provoked by human activities. "We are already able to say that the number of cloud droplets over the Amazon rainforest is aerosol-limited, which means that it depends on the number of aerosol particles which is released by the ecosystem", explains Ulrich Pöschl. In densely populated areas and in the Amazon during the dry season, where exhaust fumes from traffic, industry and slash-and-burn agriculture saturate the air with aerosols, it instead depends on the velocity of the updraft which transports the particles upwards. The scientists want to continue to investigate the atmosphere above the Amazon rainforest in the next years. For this purpose, they are now erecting a 300 metre high observational tower near Manaus, Brazil, where the current studies were carried out. "There, we want to conduct further long-term and comprehensive observations", says Ulrich Pöschl. Besides the aerosols, the scientists also want to look closer at the carbon and nitrogen cycles. "If we can better understand the natural ecosystem of the rainforest, we will be able to describe the influence that we humans exert on the climate more reliably."